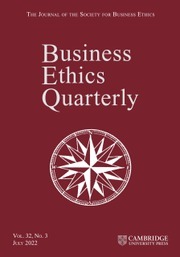 Business Ethics Quarterly (BEQ) is a peer-reviewed scholarly journal which publishes theoretical and empirical research relevant to the ethics of business, corporate social responsibility, and corporate sustainability. Recognizing that contributions to the better understanding of these topics can come from any quarter, and that the best scholarship on these themes is often interdisciplinary in nature, it publishes scholarship from the humanities, social sciences, and professional fields, as well as scholarship that crosses disciplinary boundaries. It has published articles and reviews on a broad range of topics, including the internal ethics of business organizations, the ethics of specific business practices such as marketing, stakeholder relations, and international business, the role of business organizations in larger social, political and cultural frameworks, corporate social responsibility, sustainability and environmental ethics in business, and the ethical quality of market-based societies and relationships.